HomeIn the turbulence of life, listen and wait. Why should we care about present-moment awareness? We can talk of Love, we can talk of Peace, we can talk of letting go, relaxing, going with the flow. We can talk of acceptance, we can talk of giving, and we can talk of caring-for, understanding and encouraging…but if we do not have these things…or, rather, if we do not think that we have these things…how can we give them? How can we share them? How can we act in accordance with our words? 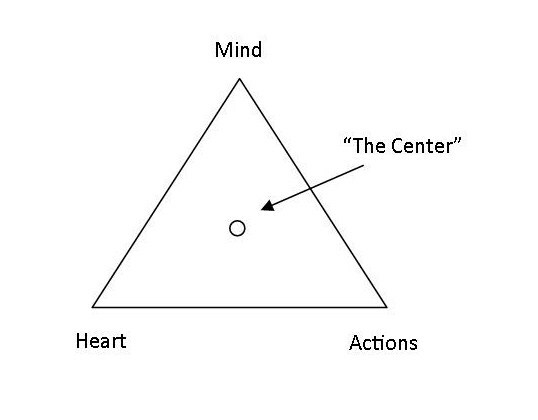 When we cultivate present moment awareness, we live in that space in the center of our mind (which brings us understanding, articulation), our heart- (which connects us with others, with the infinite), and our actions (the movement and expression of the combination of these energies). When we live in that space, boundaries (us/them/other) fade and soften allowing recognition and familiarity; we become more open to that which we might otherwise push away, resist: we accept, and as we learn to accept, we open to love…and as we open to love we experience peace…and when we experience peace, we can relax and encourage and care-for. We can give what we have and in the giving prove to ourselves that it is ours for the giving; for when we give love and peace and acceptance, we share and we retain, so there is always more to give. How do I practice present-moment awareness? There are many, many answers to this question, and ultimately the answer you find for yourself is the only one that matters. Some people use meditation, some use prayer, some play sports, or garden, or drive very fast. For this though, I would like to address present moment awareness by suggesting remaining in the center between mind, heart, and actions through listening and waiting. Thoughts move through our minds at lightning speed. We have hundreds of thousands of thoughts every day. The mind never rests; even when we are sleeping, the mind is busy with activity. This is just the nature of the mind. It processes all of the sensations we receive through our senses and breaks them down into pieces and bits. Thoughts bring us information and understanding of our external experience. Noticing these thoughts can be a bit overwhelming, because there are so many—many meditations that seek to “quiet the mind” through stillness, single-point focus, or through simply being aware of all of the thoughts that enter the mind and letting them go. So, now we have daily thoughts, the action of mind, brought together with listening with the heart. Now what? Now we think about action. Action is the expression of our inner life through our outer life. Everything we do reflects our inner-state. The more aligned we are with our inner state in every moment, the more our actions become congruent with that unity and alignment. All too often we run around life following only the direction of our thoughts. This really does make sense—our thoughts process our sensory-input, we have lots of sensory input when we act, we follow the thoughts that arise from the actions, so we act more, get more sensory input, which gets processed and tells us to act and we act some more… you get the picture! In these actions of many people’s lives, there are pre-set, predictable actions: wake up at 6 am, leave for work by 7, arrive to work by 8, take lunch at noon, etc. Within that there are the regular grocery store trips, the kids’ games, or music lessons, walking the dog. But always, many daily actions are decided by default. Sometimes we are in a cycle of action based solely on the thoughts that arise through all of that sensory input. And we don’t know any better—this is “how life goes”. This is why the practice of waiting becomes important. Waiting allows a space for the movement of the heart to direct our action, rather than the mind. This can be very unnerving for people who are so accustomed to acting according to thoughts. In waiting, one must continue moving through life (now I am brushing my teeth, now I am pouring juice, now I am unlocking my car), but also be ready to respond to the direction of the heart—this is remaining at the center between heart-mind -action. There are two ways that one can respond to the direction of the heart—either physically through the motion/movement of our bodies, or through our attitude, our thoughts, and our internal disposition. Always listening and waiting for the heart’s direction we may drive a different route to work, stop unexpectedly for coffee, slow down and open the door for someone—and if we are taking these actions because we have been listening to the movement of the heart, then each action becomes an expression of a higher unity. Sometimes, however, there is no action to take. Sometimes there is simply an attitude to express—this person needs love, that person needs a kindness, this other person needs understanding. These small things may be just the thing those people need in that moment and when we allow ourselves to be attuned to the movements and the quiet direction of the heart, all of our actions; all of our attitudes offer a gift to ourselves and to humanity. The wonder of life is that it always seeks expression, and the possibilities for this are infinite. We never really know how our actions impact another—all we can do is strive to offer our highest selves through attitude, thoughts, and actions to all people in every situation. Aligning our actions with our mind and heart, through listening and waiting, we may not understand why we may act a certain way, or say a certain thing, but we can assure ourselves that we strive toward unity and peace in all we say and do, bringing greater light into our own and others’ lives. ← Transformation is easy, when you step into something that already IS. yeowza girl ! how can i send these to a friend?